An inspirational story of how mother and daughter Tara and Patricia became ‘weight buddies’ and overcame yo-yo dieting and comfort eating to achieve their ideal weight. Not just another diet book, but an entertaining account of fighting the flab while balancing home and family life. After training at RADA, Patricia Garwood worked as an actress in the theatre and in over 100 TV productions. She is married to a playwright and has four daughters, including co-author Tara Randall. Tara was also a professional actress for 15 years and is now a life coach and NLP trainer. 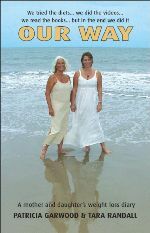 I want to thank Patricia and Tara so much for 'Our Way', which I found most inspiring! Captures what it's actually like to be concerned about weight. Compelling reading. Whether you feel the need to be trimmer or just want an endearing or enchanting read, Our Way is worth every penny.